Get Wet® Water Mister for Pets is a purified water aerosol atomizer used to conveniently cool, refresh and clean pets. Get Wet® Water Mister for Pets delivers an ultra fine mist that hydrates pets and leaves them feeling renewed and comfortable. Portable and perfect for cooling pets down during exercise, long walks, outdoor events and in hot climates. Get Wet® Water Mister for Pets is specially made with your pet in mind and only contains the finest purified water. There are no skin irritants, harmful fragrances, alcohol nor preservatives. Pet Max® Citrus Deodorizer & All-Purpose Cleaner is the perfect solution for cleaning dirt and grime from all washable surfaces. Penetrates the toughest messes left by pets including drool, urine, feces and vomit in one easy step while leaving a fresh and clean scent. Great for cleaning bedding areas, feeding areas, as well as for odor elimination throughout the home. Safe for use around children and pets when used as directed. Pet Max® Pet Odor Eliminator helps to keep pet areas smelling clean and fresh. This calming creamy vanilla scent is specially formulated to rid the air of common malodorous smells associated with pets and replaces them with a pleasant aroma in the air. Pet Max® Stain Off™ & Odor Remover is the ultimate pet stain and odor remover. Great for removing urine, feces, drool and vomit from most surfaces. Try it on soiled carpets, floors, furniture, clothing and get that “stain off” today! Corrects Pets Bad Behavior Emits a Hissing Sound to Stop Unwanted Behavior! Max Pro® Obey® is a humane audible pet training tool which corrects unwantedbehavior in pets by emitting a loud hissing sound which animals instinctively know as a negative stimulus that interupts undesirable behavior. Corrects Pets Bad Behavior Emits a Hissing Sound to Stop Unwanted Behavior! 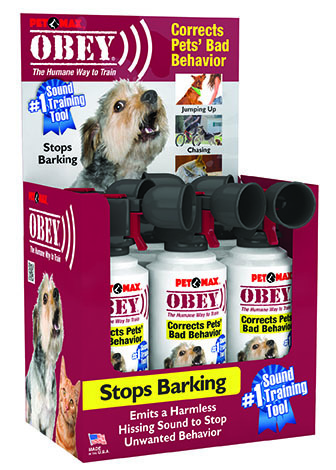 Max Pro® Obey® is a humane audible pet training tool which corrects unwanted behavior in pets by emitting a loud hissing sound which animals instinctively know as a negative stimulus that interrupts undesirable behavior.